The long-term management plan documents the predicted performance of each remedy component. The planning process identifies how performance will be assessed regarding the attainment of the interim objectives and ultimately site objectives (for example, rate of decreasing contaminant concentrations, plume stability, plume capture, or mitigation of VI). Monitoring data from startup or the initial operation of remedial systems may be used as the basis for performance predictions. Initial site evaluations that determine baseline site conditions include: estimations of contaminant mass, measurements of contaminant level, the rate of contaminant migration, and the rate of contaminant attenuation. Predicted remedy performance is documented in the long-term management plan as a baseline for evaluating actual remedy performance. The plan clearly identifies the interim objectives for making long-term management decisions, including the DQOs for future decision making. The processes to be incorporated into the long-term management plan include identifying key remedy decisions, as well as the nature, type, and quality of data required to support decisions. Properly applied, the DQO process and long-term management plan guide the collection of the right data at the right time with no data gaps and no surplus data. With this data, remedial decisions and actions drive the remediation to the desired endpoint at maximum efficiency and effectiveness—which also minimizes the project costs. The following sections describe the performance baseline, performance models, performance metrics, interim objectives and decision criteria in more detail. An example is also provided. Baseline conditions are established and documented prior to remediation system operations. Baseline data can be used for a trend assessment of contaminant concentrations at selected monitoring locations. Baseline conditions also provide a basis for predicting performance data for key remedy components. This assessment provides a basis for evaluating remedy performance and progress using the established performance data and corresponding interim objectives and metrics. A fully developed performance model includes the technical rationale leading from the baseline conditions to reaching the interim objectives, as described in the long-term management plan. A performance model is one way to develop transparent and comprehensive decision logic for assessing remedial progress. Precise, quantitative performance models may be developed as soon as site-specific data are available to support targeted characterization activities. Site information incorporated in the performance model and relevant performance metrics inform both system operation and remediation decisions. A performance model is a predictive graphic model or other predictive software model or tool (such as a statistical application or numeric/analytical software models) that describes the expected course of the remedial approach. Performance models are used to project future progress towards the attainment of the interim and site objectives. Performance models and prediction tools demonstrate, quantify, track, and support remedy progress. A performance model can be prepared for each major remedy component. Performance models are often used to project overall performance and time frames to achieve the interim or site objectives. Depending on the site, projections for each of the primary remedy components are often broken out by area or target zone (for example, the source area may have a separate performance model from the dissolved-phase plume) and potentially by COCs. The performance model documentation reflects the established decision criteria and interim and site objectives documented in the long-term management plan. Performance metrics and corresponding interim objectives may be updated during periodic evaluations as additional data are collected and trend analyses performed. The performance modeling may be repeated as new data become available. Models can also be recalibrated using recent data. The outcomes for the repeat runs of the performance model can be compared to earlier outcomes and gross discrepancies identified and reconciled (with reasons for the discrepancies identified). Once the outcomes and discrepancies have been supported or reconciled, criteria outlined in the long-term management plan may also include a CSM reassessment, with the flexibility to design and implement a contingency action (such as a change in remedy component) or remedial approach. Early in site remediation (FS or remedial design phases), the performance model may be conceptual, indicating how concentrations and mass are reduced over time or how other factors that drive cost and time will be reduced. If a quantitative model is not provided, the long-term management plan can indicate the degree to which the selected approach will reduce the time required to achieve the interim or site objectives, if at all. For those sites which do not have baselines, the performance model can be refined and interim objectives and projected time frame milestones quantified during the development of the long-term management plan. The long-term management plan can provide sufficient information to explain the basis for the model. Previous ITRC guidance may be useful in developing performance models and associated performance metrics. For example, the ITRC IDSS document includes a spreadsheet tool for estimating contaminant mass based on the 14-compartment model which may be appropriate at complex sites with DNAPL (ITRC 2015b). A performance metric provides a specific measurable indicator of remedy performance and can be measured and evaluated to distinguish successful remedial progress from insufficient progress. The “USEPA Groundwater Remedy Completion Strategy” (USEPA 2014b) describes performance metrics as follows: “site-specific remedy performance criteria, hydrologic parameters or contaminant concentration trends typically used to evaluate remedy performance and measure progress (e.g., effluent discharge concentrations, contaminant concentration trends in a monitoring well).” Examples of performance metrics include percent mass reduction, mass flux reduction, removal rate/efficiency, concentration reductions, reduction in groundwater plume footprint, and volume of soil removal. For complex sites, performance metrics can be used as a measurement of remedy progress over shorter time increments. Selected performance metrics demonstrate achievement of interim and site objectives, not merely progress towards meeting them. For example, a performance metric of “volume of soil removed” may not be sufficient to demonstrate achievement; many cubic yards of soil could be removed without meeting the soil site objectives. At many groundwater sites, the most critical performance metrics for demonstrating attainment of interim or site objectives are the contaminant concentration trends. Note that performance metrics do not necessarily provide information on the causal factors for remedy performance. Causal factors, including changes in broader site circumstances (for example, source remediation, changes in flow regimes, changes in land use, or drought) also are considered as part of periodic evaluations. Interim objectives represent short-term decision-making goals that guide progress towards achieving the final site objectives. An interim objective may represent a technically achievable endpoint for an engineered remedy component that depends on site-specific conditions such as initial contaminant mass and site hydrogeologic conditions. These interim objectives can serve as decision-making criteria to discontinue using an engineered remedy component, or a transition point to a less aggressive remedy component such as MNA until the site objectives are achieved. Performance metrics represent a larger set of measurements/criteria that are used to evaluate remedy progress. These metrics include the subset of measurements/criteria used to develop interim objectives. A specific quantitative value, rate, or time frame can be assigned to one or more performance metrics used to evaluate remedy progress that can then serve as an adaptive management interim objective. For example, for an in situ treatment remedy component, the reduction in a 95% UCL source area groundwater contaminant concentration could be a performance metric. Achieving an 85% reduction in the respective 95% UCL source area groundwater contaminant concentration within a five-year timeframe could then be a specific interim objective that represents a technically achievable endpoint for discontinuing the in situ treatment. Performance metrics and interim objectives can be modified, added, or deleted throughout a project’s life cycle as part of an adaptive site management approach as more data are collected and certain trends are identified. The applicability of these measurements is linked to the technical limitations of a remedy component that can depend on many factors. Since performance metrics represent a larger set of measurements, and interim objectives are developed from the larger set of performance metrics based on site-specific needs, these terms are often referenced together. The long-term management plan identifies interim objectives and corresponding performance metrics that will be used to evaluate remedy progress, which is especially critical for engineered remedy components. Multiple performance metrics and corresponding interim objectives can be tailored to specific types of site objectives and remedy components. Selecting performance metrics and the respective interim objectives for a site is somewhat subjective and depends on the site-specific circumstances, priorities, and available monitoring data. Reduce risk for drinking water impact over [value]% within [number] years, updated for regulatory changes. Eliminate vapor impact over [number] years. Statistical approach shows decreasing trends in total contaminant mass or concentrations in source area or at downgradient locations. Criteria that define asymptotic performance are consistent with technology limitations or need for optimization. Contaminant mass flux or discharge decreases to an asymptotic value. Target degradation/attenuation or removal rates are met. The established interim objectives and associated performance metrics distinguish acceptable from unacceptable remedial progress at key milestones. Establishing criteria for insufficient remedy progress as early as possible in the planning process prevents wasted efforts. Furthermore, if performance outcomes lag the design predictions beyond a threshold milestone identified as a trigger point, then contingency actions can be identified and implemented. The contingency actions can reflect lessons learned from past experiences at the site or similar sites. Practitioners in the environmental remediation industry can advance the development and use of decision criteria at complex sites and actively communicate or publish examples to provide others with greater detail on methods and strategy for developing robust quantitative criteria. Performance results for a functioning system can often be improved. The performance model example shows a range of acceptable results in the yellow zone that do not trigger contingency actions. Remedy optimization can improve performance within this range. Figure 6 illustrates a typical performance model. The plotted performance data are contaminant concentrations over time. Figure 6. Example of a performance model. The range of projected performance data values shown in green represents acceptable performance. The values in the red range represent a performance result that would require alternatives and contingency actions to improve performance. The yellow range depicted may benefit from process improvement. Actual performance data, based on site monitoring, are plotted as the black dashed line. The interim objective in this example is the targeted endpoint contaminant concentration represented by the horizontal blue line, below which the actual data must extend for the remedy component to be verified as a success. The ideal or acceptable range of performance data is projected from the current conditions to achieving the interim objective or specific performance goal by the end of a predetermined monitoring period. Although there is no upper bound on performance, a lower bound distinguishes acceptable from unacceptable performance. A result in the green zone is a confirmation that the system is performing as anticipated and no changes are needed. A result in the yellow zone triggers process improvements, because actual remedy performance is lower than predicted performance, or remedy performance is not optimal. This decision criterion uses interim objectives and performance metrics to trigger process improvements before actual performance data indicate failure. The range of actual performance data spans from the least satisfactory but acceptable performance results to unacceptable performance as described by the failure criteria. 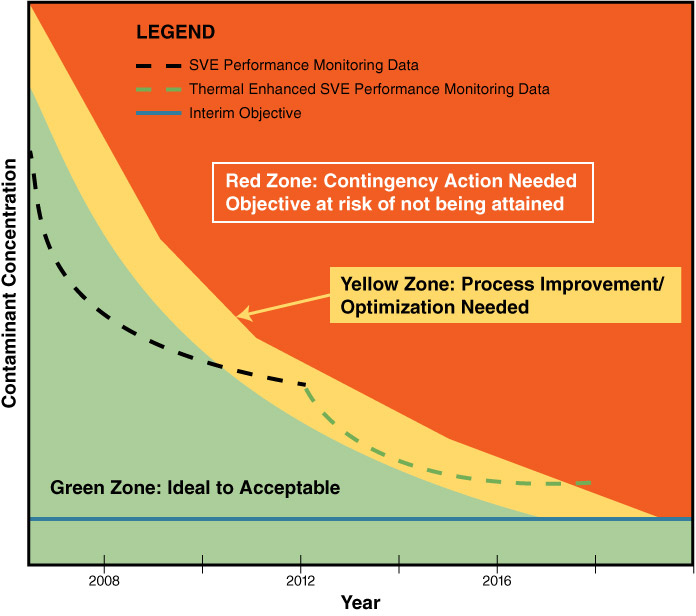 Once actual performance metrics are observed in the yellow or process improvement range, optimization and process improvement efforts can increase remedial effectiveness and efficiency, as well as return performance to the acceptable range (green zone). Process improvements continue until acceptable performance results are consistently maintained. After several iterations of process improvement, performance may still be in the yellow or red zone, triggering a contingency action. If performance does not meet the established long-term management plan decision criteria and established interim or site objectives, even after process optimization efforts, then a contingency action is evaluated. For example, the effectiveness of the selected remedy component may have tapered off, signaling that it is time to adapt to a preplanned contingency action. Transitioning to an alternate technology or remedial approach may also increase or maintain remedy effectiveness and efficiency. The Moffett-MEW Regional Plume case study includes a discussion of the East Side of Moffett Field, where a remedy was changed after the Navy requested a TI waiver. The contingency actions that are triggered by observing actual performance data values below the acceptable threshold depend on specific conditions, and are described explicitly for each site. Typically, data below the acceptable threshold either trigger process modifications to improve the current approach or contingency actions that are substantially different from the initial approach. If all known, reasonably available technologies fail, or the possible contingency actions could be more harmful than the site conditions present, then a critical objective analysis of the CSM is performed. This examination determines viable alternate methods of risk reduction. Alternatively, a contingency action may include pursuing a TI waiver consistent with the respective regulatory program under which the site is being managed, or perhaps providing evidence for adopting revisions to the decision document or associated site objectives. For CERCLA sites, this contingency action process may involve formally waiving compliance with justifiable ARARs. In some special circumstances, contaminant isolation measures may be addressed in the long-term management plan. The long-term management performance model focuses on each major remedy component and monitoring remediation performance. Additional characterization during planning phases or as a contingency action may help to mitigate these uncertainties.